alaTest ha raccolto ed analizzato 91 recensioni su Philips Philips Series 1000 Trimmer QT3310/13 For Easy Even Stubble (with USB on-the-go charger). La media della valutazione per questo prodotto è 4.6/5, confrontata con la media della valutazione di 4.3/5 per altri prodotti. Abbiamo analizzato differenti valutazioni di esperti ed utenti, età del prodotto ed altri elementi. A confronto con altri prodotti, Philips Philips Series 1000 Trimmer QT3310/13 For Easy Even Stubble (with USB on-the-go charger) ha ottenuto un alaScore™ complessivo di 89/100 = qualità Molto buono. Smal size and handy for a quick shave, bought for xmas present so not sure how it performs yet! 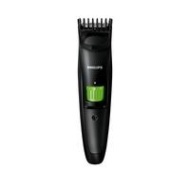 Very good beard trimmer does what is says on the box. Used it a few times and haven't had any problems with it yet. I have only had it for 2 weeks but I am satisfied with how it works. I like the compact size with only one attachment and the ability to charge from any USB charger. Bought for my son's first.. It does what it's supposed to and easy to use. Does everything its supposed to and good value for money.